In today’s review of South Australia’s most premium properties on the market, take a look inside a next-level home with views over Adelaide, a six-bedroom fully-renovated Tusmore bungalow, and an environmentally-friendly house overlooking the beach at Hallett Cove. 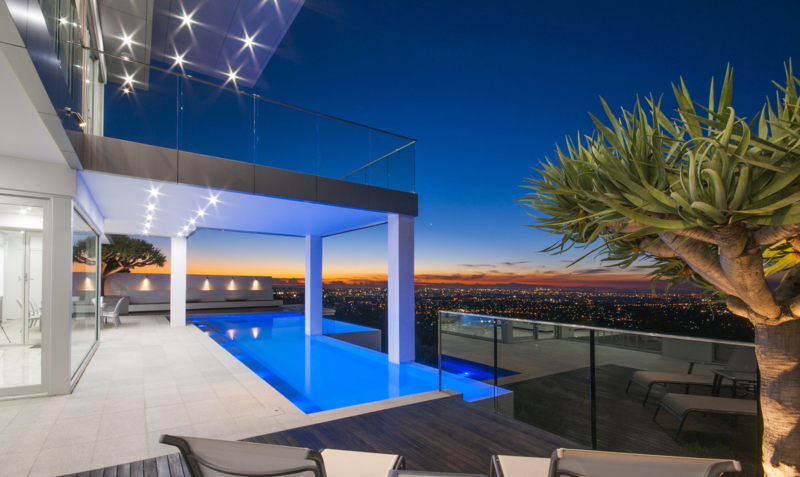 It looks like something straight out of the Hollywood Hills but this slice of sophisticated sleek is right here in Adelaide – and it could be yours for $6 million-plus. 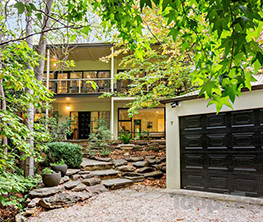 Sitting high on a hill, the spectacular Beaumont property at 21 Travers Drive is next-level luxury. Wow factors include an in-house cinema, a “day spa” including steam and massage rooms, 16-metre infinity pool and a master suite and dressing room the size of most houses. 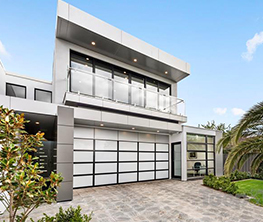 The three-bedroom, four-bathroom mansion, Villa Bella Vista, sits on a sloping 4500 square metre block and is a gleaming white monument to modern architecture, clever engineering and luxury living. It’s owned by builder and developer Bob Galvin, of the Galvin Group, and partner Sharyn Yelland, who runs her own interior design company, SY Luxury Living. 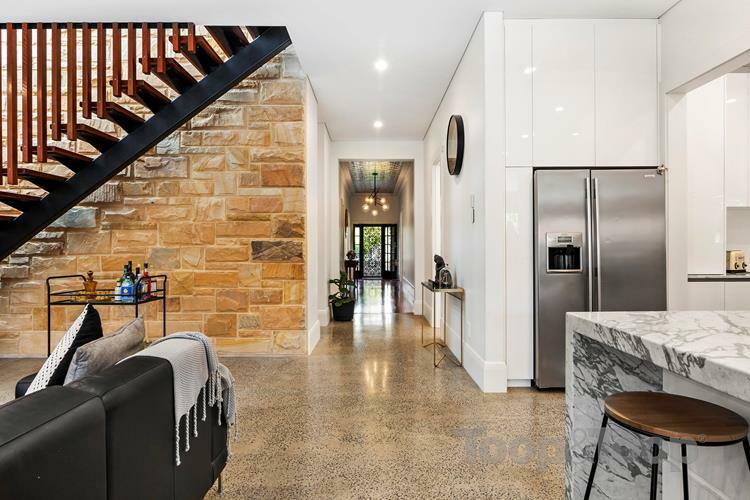 The couple bought the block, with an existing house, 14 years ago and then collaborated with Bob’s son Max Pritchard, who is design director of Galvin Group, to design their dream home. “We called the original house on the block the Waikerie shack,” Bob says. “It was perched on the side of a cliff and the driveway was so steep you could hardly walk down it, let alone drive a car down there. 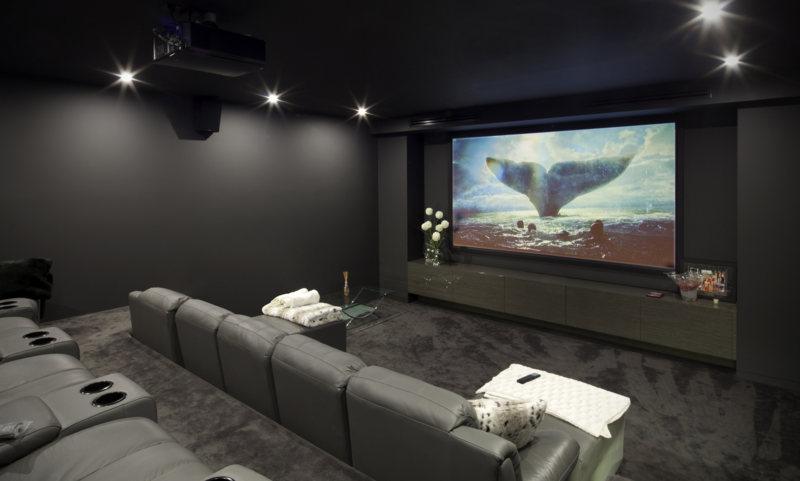 The vision was to create a home with lots of light, glass and a muted palette. That palette consisted of just three elements – white, silver and aluminium. Making the most of the views was also a must – there are four separate balconies to maximise the vista down over the suburbs to the CBD and the sea. The couple, who travel extensively, also drew inspiration from the hotels they have stayed in around the world. Construction took 18 months at a cost of $3.5 to $4 million, and while there were some robust discussions and challenges along the way, Bob says he and Sharyn are thrilled with the outcome. “The pool sits four metres off the ground, so that was a big challenge, and the house itself has a lot of steelwork because there are no walls on top of other walls – there’s a lot of glass there, so it was a very difficult build, which made it more exciting,” Bob says. The couple is often asked to host product launches in the spectacular abode, and also host visiting international stars, however, Bob was shy to name names to protect the privacy of their famous house guests. 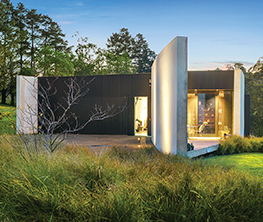 The home also featured on TV show Australia’s Best Houses and is often used for photo shoots. One of those details is the lack of door handles – the home features large door panels that lead to rooms such as the theatre room downstairs and the master suite upstairs. Environmental features include 66,000-litre water tanks and solar panels, and the couple also ensured parking for visitors – with enough flat parking spaces for four cars. Bob says he has been known to take potential clients to the home to show them exactly what the Galvin Group can achieve. “A lot of people who come here don’t say anything at first and then they call the next day and say, ‘oh my god we’ve digested everything and we want you to do our job’,” he says. Sharyn and Bob live at Villa Bella Vista with their chihuahuas Baci and Pico, but Bob says the time has come for a change of lifestyle. The couple plan to stay in the Adelaide Hills and have a new block in mind, but will downsize and travel more. “Once you have a view like this you can’t let it go,” he says. The spectacular property is being handled locally by agents Ross Smith and Grant Giordano from Sotheby’s International Realty. Grant says they are focusing on an international campaign to sell the unique property and have already had great interest. “Our plan involves showcasing such a significant property on the global stage…,” he says. Here’s one for the bigger family – a renovated bungalow in Tusmore with six bedrooms. Owners Antoniette and David Bovalina bought the rundown property in 2014 and completely gutted it and started again. 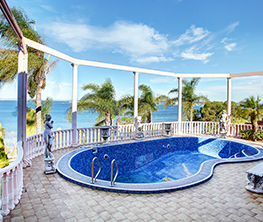 They installed new wiring, plumbing and plastering, added a second storey and a solar-heated pool. 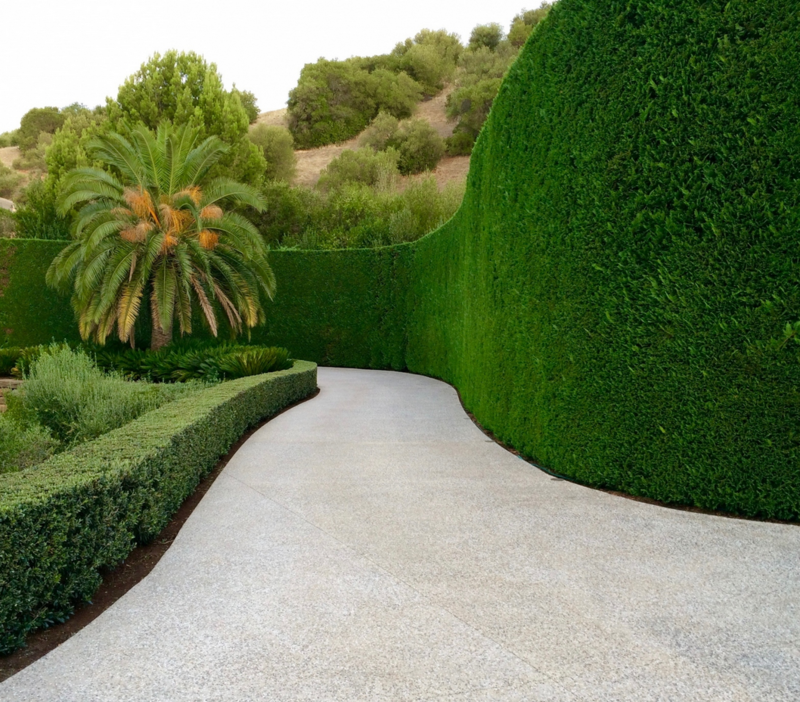 The entire process took two years and David, a tiler, and Antoniette project-managed it all. With four boys, the family need plenty of space and Antoniette says this home has been perfect. Four of the six bedrooms are upstairs, as is a second living area and bathroom – the perfect teenager’s retreat. “Even though the place was a mess when we bought it, I fell in love with the front porch as soon as I saw it, and I saw the potential of the house,” she says. While it was a massive undertaking, the couple had renovated three homes previously and were confident they could create exactly what they wanted from the old bones. A floating timber staircase with timber battens set against a feature stone wall is one of Antoniette’s favourite features, as is the pressed metal ceiling in the hall and the wood fire. Bi-folding doors and kitchen window lead out to the outdoor entertaining area including built-in barbecue and pizza oven. The double garage is fully lined and wired and could be used as another living space. “I love a lot of things about this house,” Antoniette says. However, she is looking for the next renovation project, including a big garden makeover. 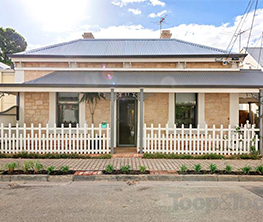 The price guide for the property is $1,870,000 – $1,970,000 and the sale is being handled by Toop & Toop agent Debi Zecevich. Expressions of interest close Monday, April 15, at 2pm. CLICK HERE TO VIEW A GALLERY OF IMAGES. An environmentally-friendly house with absolute ocean views is for sale in Hallett Cove. 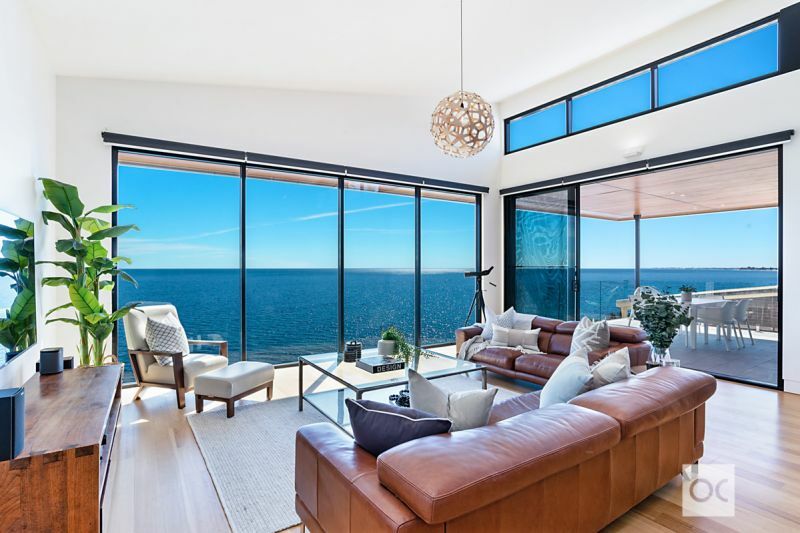 The renovated home at 3 Murnada Street overlooks the Hallett Cove boardwalk and features a spectacular wall of glass, making the most of the never-ending sea views. 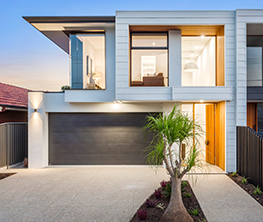 Owners Josh and Sarah Philip bought the property six years ago and began a demolish and renovation process based on sustainability, comfortable family living and making the most of the seaside location. The couple demolished the top level of the old house and poured a new slab, and also added a detached, standalone studio, where Sally, an artist, paints and conducts art classes for kids. They estimate there is only about 10 per cent of the previous dwelling left. Josh, an electrician and firefighter, managed the renovation project which included a wall of double-glazed windows. The four-bedroom home is set over two levels, with the open plan living, master suite and two bedrooms on the ground level, while the lower level boasts another bedroom, living area and bathroom, suitable for kids or guest area. As well as double-glazed windows, the home features a 7.5 KW solar system, so the power bills are “next to nothing”, Josh says. The family had planned to make this their “forever home” but the surf is calling. “I love to surf and so does my son and both Sarah and my daughter love the beach, so we’ve decided to move closer to the surf,” Josh says. The home is being handled by Ouwens Casserly agents Dianne and Darren Ladhams and offers close on April 30 at 5pm.